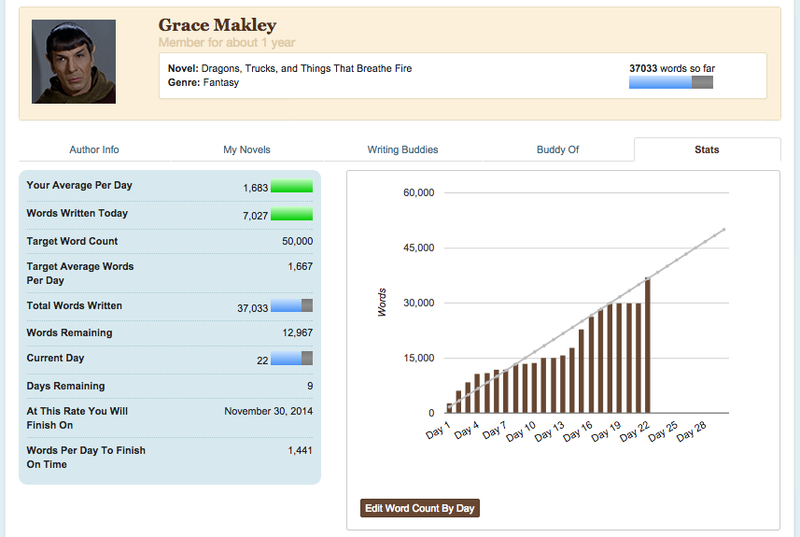 I’ve been quietly doing NaNoWriMo all month. That stats photo above is from yesterday, my most heroic day of writing so far, where I wrote 7,027 words and caught up on four days of writing in one 12-hour period. It was day 22, yesterday, and last year I didn’t break 37,000 words until day 28, so historically speaking I’m ahead! And most importantly, caught up to par, if I can manage around 2,000 words today (which I’m sure I can). Having a local writers group who are also doing NaNoWriMo has helped a lot this time around. We’ve met up for write-ins a couple times a week, sometimes at apartments and sometimes at bars, and it helps so much to be able to discuss plotting and inspiration issues with other folks who are sharing the same frustrations. 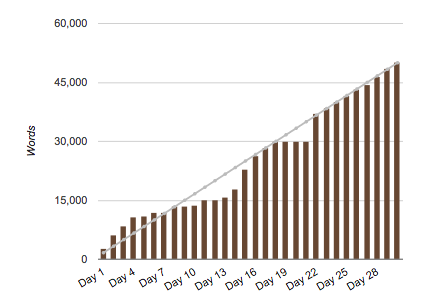 I think the best thing about NaNoWriMo this month is that the consistent goal has allowed me to notice patterns, and to be more aware of how the choices I make affect my workflow. This week, for instance, I began the week officially Caught Up after some pretty intense work days over the weekend. Monday, I stayed on track because I didn’t play a really fun looking board game with Brother, Mr. Huntington, Brackett, and Ranger B. Instead, I said hello to everyone, went into my room to write, and then said goodnight and went to bed. Tuesday, I stayed on track because I didn’t plan a big dinner for myself and Mr. Huntington. Instead, I microwaved something for myself after work while I caught up on my word count, and then I invited him over afterwards to watch Adventure Time and drink hot chocolate. Wednesday, I had a horrible, no good, very bad day at work, and I didn’t write because I only had enough energy afterwards to eat the dinner Mr Huntington cooked for us and go to bed early. Thursday, I didn’t write because I attended an event with Mr Huntington after work, and then got dinner with friends, and then it was bedtime. Friday I PLANNED to write, and I invited over some writing buddies for that express purpose… but sometimes your writing night turns into a medley-themed party (we had a carrot medley, a ravioli medley, and a wine medley) and I had a beautiful time talking with my friends and didn’t write a single word. And all of this was allowable, because I did have a spare 12 hours on Saturday, yesterday, in which to write for all four days. So the lesson is compromise? It’s always been compromise, but when I don’t have a clear goal the things like boardgames and events and nice home-cooked dinners always take precedence over spending a few hours alone with my computer. And I think we’re somewhat conditioned to choose the social activity, to do the thing, to not be lame and not be a hermit. And I don’t regret the choices I made on Wednesday, Thursday, and Friday to be social rather than productive. The social activities were seriously important and productive in their own ways, good for my relationships and good for my mental health. The difference between this week and every other week was that I knew what those choices meant for my writing goals as I made them, and I traded those three nights for my entire Saturday. And then I followed through, and caught up to my goal. ADDENDUM: Speaking of goals, remember that Sketch-a-day challenge I started in December last year? I didn’t complete it last year, but this year I’m going to try again and think I can do it. Stay tuned.